Travel Restraint Systems – Summit Anchor Co.
A horizontal cable system is a permanently installed fall protection system typically consisting of two terminating roof anchors connected by a galvanized steel or stainless steel wire rope. Summit Anchor Co. offers horizontal cable systems to provide fall restraint or that can be designed to be used for anchorage in difficult areas of a complete building rope descent system package. The ANSI/IWCA I-14.1 Window Cleaning Safety Standard requires fall protection whenever a worker must travel within 6 feet of a vertical drop. Fall protection may be in the form of a code-compliant guardrail or parapet. When such code-compliant perimeter guarding does not exist and cannot be installed, a horizontal fall restraint cable system may be the best option for providing fall protection. This horizontal cable system is designed to restrain workers from reaching a roof edge, thereby preventing them from falling off an elevated surface. Summit Anchor Co.’s horizontal fall restraint cable system can safely allow up to two workers continuous horizontal movement across spans of up to 150 feet when intermediate anchors are evenly spaced along the span. Below is an example of how a horizontal fall restraint cable system may be utilized. 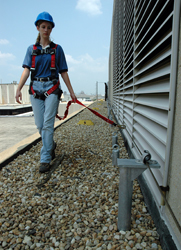 This horizontal cable system is designed to allow a maintenance worker to descend in areas of a building where anchorages cannot be placed so that the angle between independent ropes does not exceed the maximum 15 degrees allowed in the ANSI/IWCA I-14.1 Window Cleaning Safety Standard. As shown in the photograph below, when horizontal cables are used for rope descent, they must be installed in pairs so that a worker can attach a suspension rope to one cable and a fall arrest rope (lifeline) to another cable. One horizontal cable shall never be used to simultaneously secure a worker’s suspension rope and fall arrest rope. The anchors between which each cable spans may be placed no more than 30 feet apart. Because a total of four anchors are required for each descent, this system is generally not economical and therefore should only be used when unique building features do not allow a worker to tie a suspension rope and a fall arrest rope to independent anchorages and maintain the required 15 degree angle. Due to the potential for misuse of horizontal cables in day-to-day field operations, portable cables would never be used for this application. Workers shall only use permanent horizontal cable systems that have been specifically designed by a Professional Engineer with a background in such applications. These systems shall also be installed in the field by a qualified person, and instructions for proper use must be readily available on the site.